Stockholm 2012: Oslo designer Thomas Jenkins of Studio Jenk presents a series of candle sticks made of three different metals but with exactly the same weight at the Greenhouse exhibition of young designers at Stockholm Furniture Fair this week. The height of each candle holder is dictated by the amount of material needed to make up the weight, since each has a different density. Jenkins also presents a folding chair with a coiled, spring-like pivot and a welsh dresser with simple wooden shelves supported on copper pipes. The thin copper tubes pierce the dowel uprights to for horizontal supports for the shelves and a backrest for plates to be lent against. The dresser was commissioned by a local cafe but Jenkins is now looking for a producer. Stockholm Furniture Fair continues until 11 February. See all our stories about it here. They didn’t have a massive budget (read cost price plus a few beers!) so we set about creating a solution that we could manufacture internally in our prototype workshop. This meant creating a very simple system using only the tools we have available to us and trying to keep manufacturing time as a low as possible. A folding café chair that takes its name from the manufacturing technique used. The chair’s pivot is created by combining modern CNC bending technology with age old spring manufacturing techniques. 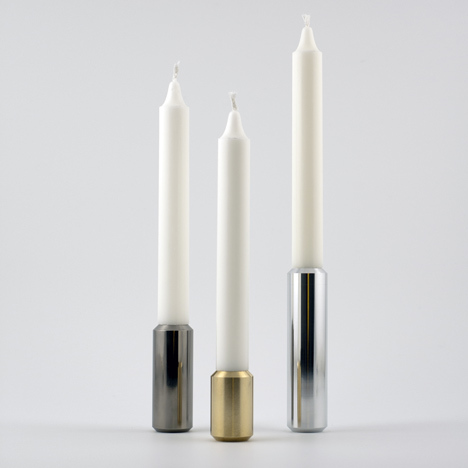 A family of candle holders where mass takes priority over form. Each item has an identical mass of 200 grams and so each item only differs from the next in the material used; aluminium, titanium and brass. Their heights are therefore a result of the materials' density.